It’s official – Decemberadio is coming to Galax! Praisin’ LOUD in the Park will be a community wide youth night JULY 19th 2009! The best part is – it’s going to be a free concert! If you want your church to be involved – there will be some benefits for your group! More details coming soon! Now that my youngest is almost five I don’t use a stroller anymore. When my babies were little I LOVED strollers. I would walk around the mall looking at strollers like a 16 year old in a car lot. 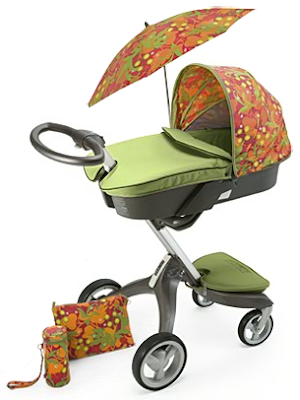 During our strolling years we had the convertible stroller the car seat docks into, a couple of umbrella strollers, a double stroller with the car seat dock. a double jog stroller, a single jog stroller, a light weight compact stroller for the Disney trip, and a bike trailer (that converts to a stroller). If you add all those together I still don’t think it touches the price of this high-end celebrity style stroller. The picture above is the Stokke Xplory with the forest accessory packeage. Here is where you can check it out if you have a baby on the way and an extra $1200 laying around:) Glad I’ve kicked my stroller habit. I am taking off this morning for sunny South Carolina with about 20 amazing Cornerstoners to take in the contagious passion of NewSpring Church at Unleash. All that said, watch this video that was put together by some Saddleback guys to see why I really go to conferences . . . yep the hotel! I am having a little bit of trouble getting used to the time change. The kids had trouble settling in last night and getting up this morning. I love that it is light until 7:30 but waking up in the dark is a little hard to get used to. On top of that I haven’t slept well without Mike by my side – so I’m feeling a little dead in the mornings. As you can see from the picture so are my boys. Emma was a little easier to rouse around this morning but Luke and Drew were dead heads. As you can see Luke had a serious bed-head induced mohawk. Since the snow is probably going to be gone today I thought it was time to post some pictures from Sunday. It was the perfect day for playing- the snow was still falling, it wasn’t terribly cold yet and the kids were super excited. When I was a little girl my Mama and Granny used to always help my sister and me make snow cream. It brings back good memories of my Granny when I smell the vanilla and sugar. I can even remember the big orange plastic bowl we used when we made snow cream at her house. Here are pictures of my kids making snow cream and a quick how to if you have never made it. This is soooo good. I just ate a warm piece from the oven. Great on a cold snowed-in day. Let cool in pans for 10 minutes and then remove from pans, gentely peel away wax paper and let cool completely on wire rack. Enjoy – be nice and give one loaf away. You’ll make someone’s day. That’s what my kids say when it’s snowing and starting to accumulate. It’s not snow that’s piling up at my house it’s LAUNDRY!! Any of you that know me know that I hate laundry and most of you that have multiple children can relate. Since I have been feeling “yucky” with a rotten cold “it’s piling up”. This is a picture that I took a few months back wen I opened my dryer door and saw these little beady eyes staring back at me. They are Mr. Potato Head eyes that somehow made it into my wash. That’s how I feel today – the laundry is staring at me saying “HA, HA – you’ll never catch up now” OK – maybe that’s a little dramatic but it can be a daunting task. How do you handle laundry and keep it under control?